This series mixes hand-crafted elements with vintage inspired flowers and spacers in burnished gold plate with textured beads in a wonderful range of colours, to achieve a very wearable and versatile collection. 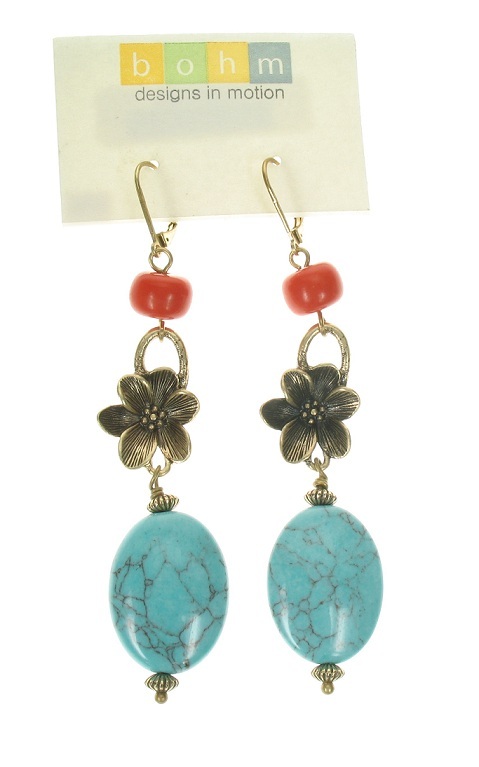 Available in coral/turquoise or brown/turquoise colourways. Stretch style chunky bead bracelet. The bracelet gently stretches to fit the wrist comfortably. Unstretched it measures approx. 18cm/7 inches. Smallest bead (not inc. metal spacers) 1.3 cm/13mm largest bead 2.5cm/25mm. Vintage gold plate with Coral/Turquoise. Stretch style chunky bead bracelet. The bracelet gently stretches to fit the wrist comfortably. Unstretched it measures approx. 18cm/7 inches. Smallest bead (not inc. metal spacers) 1.3 cm/13mm largest bead 2.5cm/25mm. Vintage gold plate with Brown/Turquoise accents. 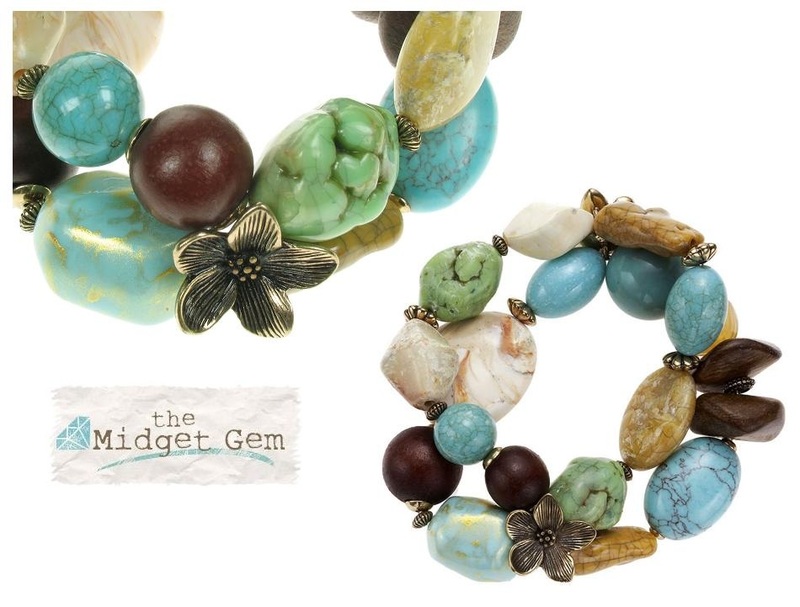 Long length necklace with chunky beads and hand-crafted floral elements decorating it. The necklace measures total length 40 inches/102cm, we have experimented with this and you can achieve two-twists (fastens with a clasp), so it can be worn as a shorter two-layer necklace. Smallest bead (not inc. metal spacers) 1 cm/10mm largest disc 3.5cm/35mm. Various paste, wood and semi-precious beads. Vintage gold plate with Brown/Turquoise/Green accents. 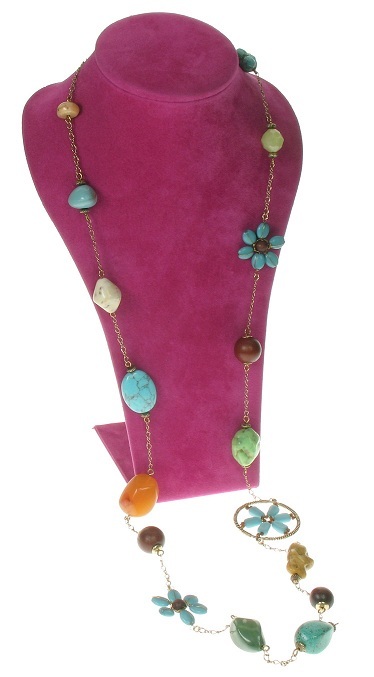 Long length necklace with chunky beads and hand-crafted floral elements decorating it. The necklace measures total length 40 inches/102cm, we have experimented with this and you can achieve two-twists (fastens with a clasp), so it can be worn as a shorter two-layer necklace. Smallest bead (not inc. metal spacers) 1 cm/10mm largest disc 3.5cm/35mm. Various paste, wood and semi-precious beads. Vintage gold plate with Coral/Brown/Turquoise accents. Pretty dangly drop earrings. 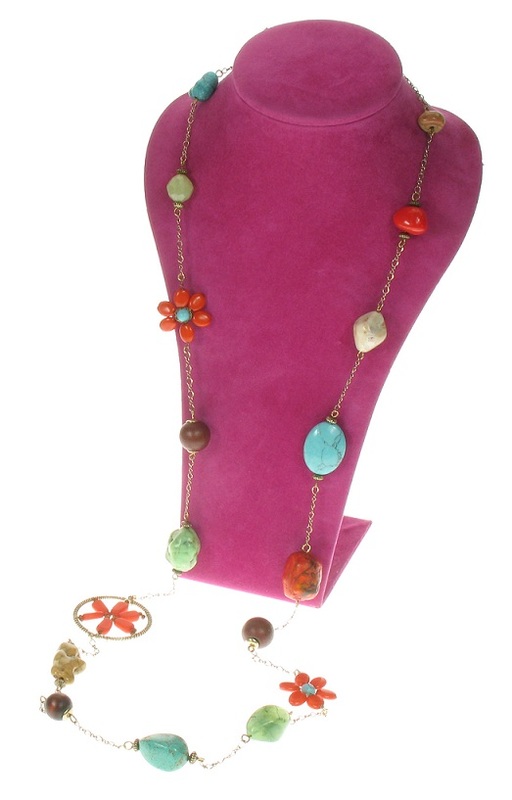 Vintage gold plate with Coral/Turquoise beads. French clasp fastener for pierced ears. Total length 8.5cm/85mm. 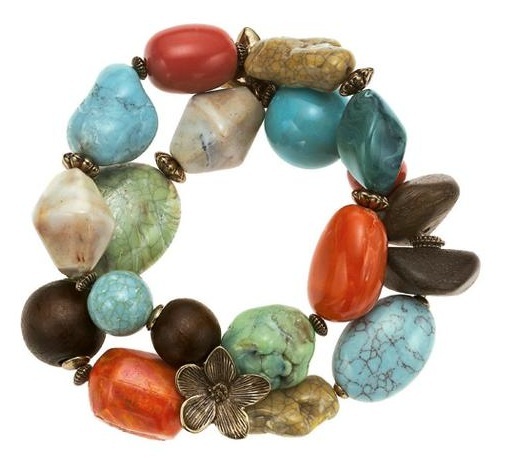 Turquoise beads are 2.5cm/25mm long.